Summer is almost upon us and the great weather we’ve been waiting all winter for is starting to appear. But what to do…what to do? For many it’s festival season in Britain. 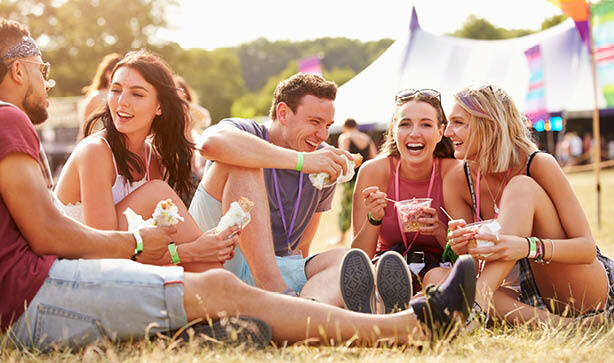 If you don’t fancy getting muddy and smelly with the hordes at Glasto, spending a more leisurely weekend enjoying some tasty grub and refreshing cold ones – you should head to one of the many Food Festivals. Perhaps you’ve heard of food festivals and are not really convinced that they will be interesting enough. Perhaps you are imagining a small gathering of people with a few marquees and some food stalls. Think again. As we hope you will see from the following post, Food and drink festivals are a great day out for not just adults, but the whole family. Food and drink festivals in the UK have come along leaps and bounds over the last few decades to become truly memorable celebrations of all things edible and drinkable. Although there are still some low-key affairs, many of them are highlights in a town or city’s calendar of events. Some are one day, while others stretch over one to two weeks and while it is rare, you may find that some last a whole month. The sheer quality and range of food showcased at these events is often nothing short of incredible. Depending on what you like to eat and drink, you are bound to find something that appeals. Some are themed wile others just represent a broad range of cuisines from a specific area. For example, Festa Italiana in Manchester centres around, you’ve guessed it, Italian food and is arranged and put on by the city’s Italian community. While The Cheese and Chilli Festival centres around the hot and savoury. As a nation full of ale, beer, cider, gin and wine lovers (who also love vodka, whisky, whiskey and brandy) there are always some kind of drink options at even the more food-centred events. Though there are events such as the Oktoberfest (based on the famous German beer shindig) and many more that focus the attention on the alcohol, with the food playing second fiddle. In much the same way that a music festival like Reading and Leeds or Glasto is not just about the music, food festivals always feature a whole lot of stuff throughout them to keep you entertained. Whether it is specially arranged performers for children, live music, cooking demonstrations or just some fun and games – there is actually a lot more to food and drink festivals than the consumables! Many food and drink festivals are held in the local town or square, which is a great way to enjoy a city’s architecture and history. However, more often than not, because of their size and scale, food and drink festivals take place at local parks or within the grounds of some stunning stately home. So, as well as getting the chance to taste a lot of fine grub and some delicious examples of your favourite tipple – you get to do it all at a very pretty location. In some ways, food and drink festivals could be seen as being events that encompass everything that is great about a summer time weekend in the UK. If you have ever been to Glastonbury, T in the Park, Reading and Leeds or one of the other big music festivals this country is famous for – you will know only too well that every, for the most part, is in a great mood. It is very much the same at food and drink festivals. There is something about the sun shining, the fact that everyone is there for the same reason – for a great time, great food and great drink. It makes everyone smile and jovial. While it would be foolish to say problems don’t occur – because let’s face it, they can happen anywhere. However, incidents of bad behaviour and things like that just don’t happen much at food and drink festivals. Everyone is too busy enjoying the live music, cookery demonstrations and oh….what else? Yes, the amazingly delicious food and cool and refreshing drinks to care about arguments and fights. If you want to enjoy getting to know people with similar interests to your own, with a food and drink slant; or just want to spend time with your family in an amazing location with lots of tasty food that means you don’t have to cook. Visit eatdrinkseek.co.uk to find out about food and drink festivals in your local area. This is a great resource site, that is regularly updated, that tries to list all of the food and drink festivals that take place throughout the country over the course of the year. Copyright © 2019. The Forgetful Wife.